Join us for St Patrick’s Day! On Saturday 17th March, the world will come together to celebrate the annual event that is St Patrick’s Day – and there are few better places to do so than right here in London. Traditionally celebrating the arrival of Christianity in Ireland, the event has evolved into a celebration of the entire Irish culture; the points, intricacies and all things wonderfully enviable about our neighbour from across the Irish sea. 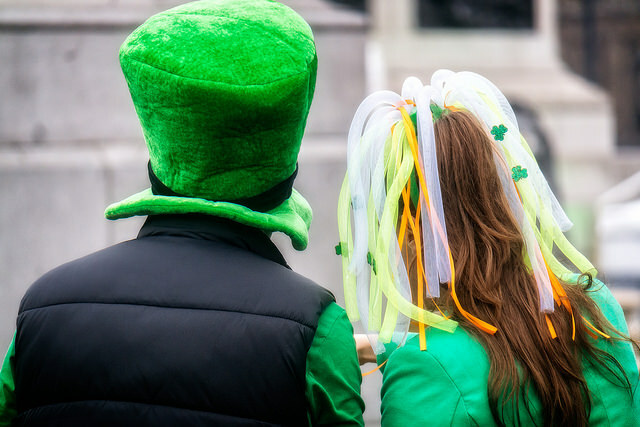 With a wave of green so often seen throughout the streets of London, a stay in the city when it’s St Patrick’s Day can make for a fantastically memorable experience for a whole host of reasons. And one of the most popular has to be the brilliant St Patrick’s Day parade that happens every year right in the centre of London. Into its sixteenth year, the parade regularly attracts crowds of over 100,000, and this year it’s been speculated that it could be the largest ever. Whilst the event is known as a ‘parade’, most would agree it’s most like a festival now – especially as this year it’s stretching over three days and extending out of the original Trafalgar Square location to include all 33 London boroughs in some way, shape or form. It’s going to be almost impossible to not get caught up in the St Patrick’s Day spirit over the three days! One of our favourite parts of this year’s parade, there’s going to be a dedicated family zone in Pall Mall all afternoon from 12pm to 6pm on Sunday 18th. Including everything from games and stilt walkers through to workshops and stories of traditional Irish tales, just like the event in its entirety, the zone is completely free for families to make use of. With the parade itself taking place on the Sunday from 12pm, the procession of floats, bands, dancers and more will make the 1.5 mile journey from Piccadilly to Whitehall taking in numerous locations and landmarks along the way. Always a fantastic event, add into this the parade’s focus on women this year (‘#BehindEveryGreatCity’ is the hashtag being used throughout the event for people to share stories of their own about inspirational Irish women) and it’s definitely one not to be missed – and one that’s sure to satisfy your needs for a bit of Irish culture! Whilst the parade is undoubtedly one not to miss, it’s hard to argue against the fact the last match of the Six Nations will be a highlight of the weekend for many – not only is it on St Patrick’s Day itself, but it’s between England and Ireland! Taking place at Twickenham Stadium, the stadium has a long reputation as being one of the most favourable locations for rugby fans. Able to hold 82,000 people (it’s second only in size to Wembley), and whilst England have more wins over Ireland on their Test record, at the time of writing this the odds are very much even for either team to win. Whether you’re watching live at Twickenham or on TV, you can expect an electric atmosphere to ripple through the city until the very last kick of the game (at least!). Being a short walk from the centre of the St Patrick’s Day parade activities at Trafalgar Square and with it only 30 minutes from nearby Green Park tube station to Twickenham Stadium, however you’re planning to celebrate St Patrick’s Day this year, we’d love to see you staying with us at DUKES London. And with our current 3 for 2 offer giving you the ability to stay for an extra night for free – and that includes in our suites – along with our special selection of Irish beer, whisky and Irish coffees at GBR, you could be close to all of the action whilst knowing you can retreat to a little piece of luxury every night (and always start and finish it with an Irish tipple or two! ).